1. Peel potatoes and cut into round slices. Layer bottom of large casserole dish with potatoes. Sprinkle with salt and pepper. 2. 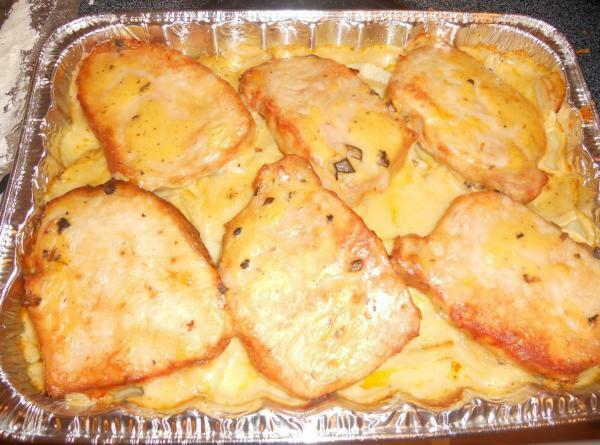 Coat pork chops with flour. 3. Heat oil in large skillet and brown pork chops on each side. 4. Arrange pork chops on top of potatoes. 5. Heat soup with water and pour over pork chops and potatoes. Cover with foil and bake at 350 degrees for 1 1/2 hours.